Now we make our Blue Sky! You survived the 4 patch path and don't hyper-ventilate when I tell you what you need for the sky. After you are done with this block it is all easy piecing. I promise! Cut 2" strips from your blue and white scraps or fat quarters. 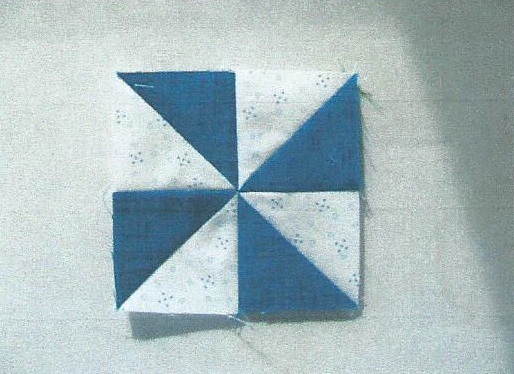 I did use the same white with a blue dot throughout the whole quilt. But my blues are scrappy! Take one white strip and one blue strip, right sides together. I put the white strip on the bottom. Use the Easy Angle ruler and cut the 2" mark. Just like you did for the half four patch triangles. This will make triangle pairs and they are ready to sew! Don't take them apart. Remember to scrap up those blues! I put them in stacks of 10 and take several stacks to the sewing machine at a time. I sew across the angle and this makes a square half white and half blue. You will need (gasp) 388 of these little units. Finger press your seams to the dark and trim off those little dog ears now. You will be glad you did. Put four together to make a pinwheel. All your pinwheels need to spin the same way - very important! You need to make 96 pinwheels. NOW - You can make these the Jenny Doan, Missouri Star Quilt Co. way. And quite honestly if I wouldn't have had my strips already cut into 2" strips I might have made them this way. Both ways take a while to piece, just put on some good music and go to it!! Cut white and blue strips to 3 3/8". Take one strip of each color, put together, right sides facing each other. Subcut into 3 3/8" squares. Keep together in a pair. Sew all around the outside edge of the square 1/4" from the edge. Cut across this sewn together square diagonally, corner to corner, twice. Be careful not to move the square between cuts. You cut an X across the square corner to corner. Open and finger press to the dark fabric. Lay out your pinwheel, trim your corners and sew back together. Make sure all your pinwheels spin the same say! Press this very carefully!! You have biased edges that you are working with and you do not want to stretch them. That is why I finger press the units, no iron pressing until the unit is done. Just my way! Try it - it may help your units not to turn out a little wonky! Measure your pinwheel when finished. It should be 3 1/2" square. You also need 4 half pinwheels! 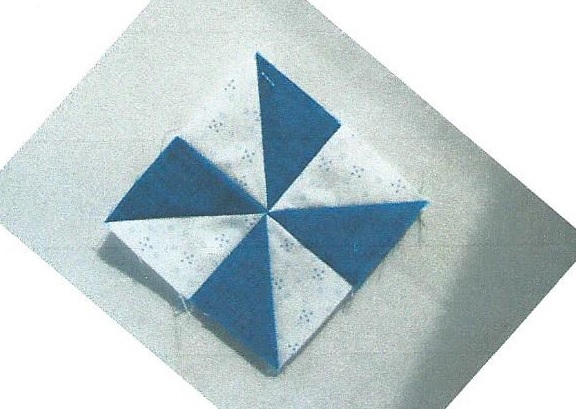 You need 1 blue strip and 1 white strip - can be scrap ends from your previous pinwheels that were made. Stack them right sides together. 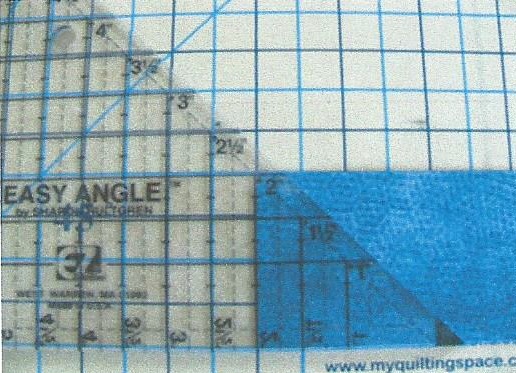 Cut with the EZ angle ruler - two pairs. Sew one pair together to make your square - half white, half blue. Take the other 2 triangles and put them on the side of the square to make a triangle, like you did with the half 4 patch triangle. Look at the picture and make sure your pinwheel part turns the same direction as your other pinwheels!! 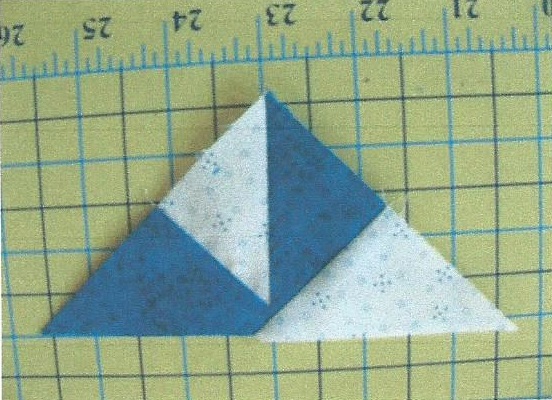 You can cut a blue and white square 2 3/8" and cut across them once diagonally to make your triangles. Click Here to Continue to Fourth Clue!